The full form of RCP is Rich Client Platform. Earlier Swings ,Applets were used for rich client applications. With the advent of Eclipse RCP, Eclipse RCP takes the front seat even though it uses most of the SWT and Swing features. There are lot of chat applications and stand alone applications that extensively uses the feature of Eclipse RCP. Lot of VB and other applications running on Swing and AWT are moving to Eclipse RCP as RCP provides lot of features. We’ll explain more in detail later. Eg. IBM Sametime uses Eclipse RCP. As mentioned earlier Eclipse is one of the most widely accepted and robust IDE that is used in the industry, there are lot of advantages of the applications build using Eclipse. There is lot of information related to Eclipse in the net as it’s one of the most popular IDE that’s used. Since Eclipse belongs to the open source community there are lot of enthusiasts contributing to the development and betterment of Eclipse. Eclipse 4 is better compared to Eclipse 3 and the model adapted for programming is much simple. The tool support for Eclipse 4 is still evolving. 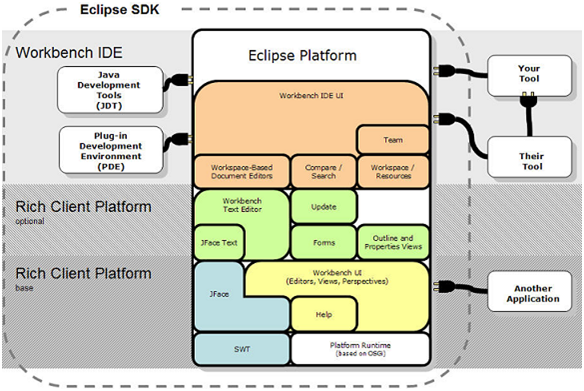 Eclipse IDE consists of different components that are listed below. Eclipse RCP uses only a subset of these components. The Eclipse architecture is built on the OSGi specification. The reference implementation used for this is the Equinox framework from the OSGi. Normally plug-ins are called bundles and bundles can be called plug-ins . Normally all over in the software world bundles are more common. Bundled software is very common in open source community. A plug-in is like a library or collection of code that can be reused, plug and played. Services are also defined by OSGi. Normally the setting up of these services are bit difficult and is not widely used in Eclipse 3.It is seen that Eclipse 4 applications uses some of the services from the OSGi framework.